INTI International College Penang’s New South Wales High School Certificate (NSW HSC) students recorded a stunning 100 percent pass rate this year. INTI top HSC achievers with Dr. Michael Yap, Chief Executive of INTI International College Penang. Nicole Ann Mathews, a recipient of INTI’s Centre of Excellence Pre-University Studies All Rounder Award is also the highest scorer with ATAR of 98.95, whilst Tan Wei Khang is at second place with ATAR of 98.05 and Lee Chop Yan at third place with ATAR of 94.70. Nicole, an INTI e-scholarship recipient whose ambition is to follow her parents’ footsteps to become a doctor, said that she chose to study HSC at INTI because it was the shortest pathway to her university education, and her advice to those considering studying HSC is to be prepared for the pace of this 11-month programme. “You must learn to manage your time effectively by having an organised and regular study schedule so you do not leave studying only during exam periods. In addition to studying, you should also join clubs and societies which caters to your interests and be open to trying new things, as this would further enrich your learning experience,” she said. 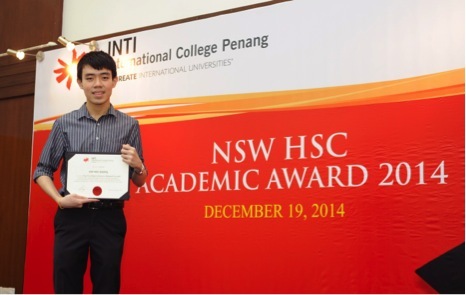 Wei Khang found his learning experience at INTI enriching and enjoyable. “The lecturers here are highly experienced and really helpful – they would go the extra mile to help their students, which I am really grateful for. In addition to that, the environment at INTI is just fantastic as I had a lot of fun. These past few months have been the best time of my life so far!” he explained. This year, 30 INTI NSW HSC student obtained high distinctions (Band 6/E4), whilst another 128 obtained distinctions (Band 5/E3). Collectively, they achieved higher pass rates than that of the world in all subjects. Entry into universities depends on the ATAR, a measure of the student’s overall performance in comparison with all students taking the NSW HSC. At INTI Penang, a wide range of subjects is available in the sciences and commerce, and students may combine subjects from the two for broader options in tertiary studies.